B+ - Wes Anderson's distinctive authorial signatures—the fussy, nostalgia-rich production design, the playful movements of his camera, the droll labeling of chapters and even shots—has at times been derided as a dollhouse aesthetic, more suited to playthings than real people. It's not a criticism I share, but there you have it. One might say that Anderson's latest feature, Fantastic Mr. Fox, responds to such objections by taking them at face value, as it was made using literal dolls. Well, stop-motion puppets, to be precise. A more natural fit between a particular style of animation and a living auteur would be hard to imagine, as Anderson's propensity for treating every shot as a tableau is given its most ebullient expression yet. There's something damn near perfect about the marriage of Mr. Fox's old-school animation—which heartily embraces an aura of toybox unreality—to the director's natural affinities. Anderson is an artist who thrives on meticulous attention to detail and on making every shot count, and animation provides ample opportunity to indulge such impulses. Adapting Roald Dahl's slim children's novel of the same name, Anderson and co-writer Noah Baumbach necessarily expand the original tale of chicken thievery and vengeful farmers. 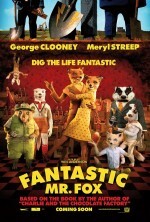 The film bestows more human qualities on Dahl's animal characters, constructing a whimsical rural landscape where adult foxes wear suits and write newspaper columns and young foxes go to chemistry class and play Whackbat. (This is a cricket-like game played with a flaming pine cone, whose complexity amusingly and quite deliberately surpasses that of Harry Potter's quidditch.) Mr. Fox's characters might speak with American accents, but the clear template for Anderson's approach to his anthropomorphic animals is The Wind in the Willows. However, the mysticism and class allegory in Grahame's story is swapped for a distinctly American strain of ambition and discontent, and if there's one thing that Anderson knows how to do well, it's portraying talented yet dissatisfied people (or foxes, in this case). We learn in a prologue that Mr. Fox (George Clooney) is a skilled and irrepressible thief whose exploits have a habit of getting him and his family into hot water. Having been convinced by his wife (Meryl Streep) to give up poultry purloining several fox-years ago, Fox declares that he wants to move out of their earthen den and into a picture-perfect hilltop tree. That said tree overlooks the wealthy farms of the nasty Misters Boggis, Budge, and Bean (one fat, one short, one lean) doesn't really register with Mrs. Fox. That is, until her husband starts sneaking out with Kylie the Opossum for nighttime raids and the cupboard inexplicably starts filling up with chickens, geese, turkeys, and cider. Eventually the farmers, goaded by the especially unpleasant Bean (Michael Gambon), declare war on the foxes, and a tale of escalating hostilities between men and pest ensues. Along the way, there are several sub-plots, among them the rivalry that develops between Fox's sour, diminutive son, Ash (Jason Shwartzman) and his visiting cousin, the all-around prodigy Kristofferson (Eric Chase Anderson). The Fox family dwells in a marvelous, autumnal-hued landscape of vast skies and rolling hills, reminiscent of a stylized oil painting. Anderson constructs this postcard pastoral setting for its superficial aesthetic charms, not because he's especially enamored with its ideals. His film's farmers are not rustic men of the soil, but heartless titans of a modern, mechanized agribusiness, more prosperous kin to Chicken Run's Mrs. Tweedy. Some class- and race-tinged allusions aside, however, Mr. Fox is chiefly concerned, as all of Anderson's films are, with personal drama, most especially familial relationships and the reconciliation of desires with reality. Here that latter theme dovetails slyly—though not always elegantly—with the animal characters' struggles with their wild natures, a problem given its most succinct expression by the hero himself: How can a fox ever be happy without a chicken in its teeth? The profundity of this statement might be dubious, but Mr. Fox is ultimately less concerned with messaging than amusement, and one senses than Anderson derives a great deal of amusement out of hearing such familiar navel-gazing statements issue from a fox's mouth. Indeed, what separates Mr. Fox from the rest of Anderson's output is not its conspicuous animation technique, but its decidedly light tone, even in its gravest moments. (A favorite line: "At the end of the day, heâ€™s still just another drowned rat in a dumpster behind a Chinese restaurant." This is delivered not as a howl of existential despair, but a gag at the expense of the film itself.) If Mr. Fox feels a tad trifling, it's because Anderson aims to tell a silly little story with such absolute precision, all while winking at us as if to say, "Relax, it's just a silly little story." The model trains that clatter through the film hint at the film's joyous tone and the director's self-awareness. Like a real-world train enthusiast, Anderson is eager for us to coo with delight at the dense texture of his fuzzy little world, but he never loses sight of the fact that he cares about its minutiae much, much more than we do. Mr. Fox is one of those rare films that feels like a painstaking labor of love for its creator, while only needing to be liked by its audience. Much will be written about the look of Mr. Fox, with its impossibly detailed design and herky-jerky movements, which brings to mind the Rankin/Bass animated holiday specials. (Anderson, whose soundtrack choices always work more by intuition than logic, even alludes to Rudolph the Red-Nosed Reindeer by including a couple of Burl Ives tunes.) Suffice to say that the film has forsaken realism for an appealing tangibility, practically inviting the viewer to reach out and stroke its character's fur or fiddle with its miniature bric-a-brac. If only 2009 hadn't also given us Henry Selick's overlooked masterpiece, Coraline, then this would be the best stop-motion feature film in years. The perfection of Coraline's gothic world is a hard act to follow, and Mr. Fox too willfully clings to its artificiality to surpass that film's sheer dazzle. Although the source material is a children's classic, I hesitate to label Mr. Fox as a children's film. To be sure, at the screening I attended, all of the young audience members were transfixed, with barely a peep of discontent or boredom to be heard. Unless you regard drinking and smoking characters as too much for young eyes to handle, Mr. Fox is determinedly kid-friendly. One of the film's most memorable touches is its substitution of "cuss" for swear words, a gag that almost, but never quite, wears out its welcome. (I defy any adult not to titter at the phrase "clustercuss".) However, this bit of dialog tomfoolery hints that the film's primary audience is adult. While there is some cartoon slapstick, Anderson and Baumbach prefer the dry, character-centered humor that has come to characterize the former's films. The Andersonian approach to character is in evidence throughout Mr. Fox, and while the heroes' tribulations seem less dire by dint of the fact that they are animated animals, the telltale longing and sadness are still there. The Ash-Kristofferson subplot in particular operates within the male-male rivalry framework the director favors, but it's also one of the weakest examples of such within his filmography, and the film's most unsuccessful dramatic note. However, what is most conspicuous is not the film's potency or lack thereof but the odd fit between its sensory delights and its thorny emotional landscape. (How many other alleged children's films would dare feature the line, "I love you, but I never should have married you." And then just leave it out there?) These elements are never completely at ease with one another, save perhaps in an unusual scene late in the film, one filled with a profound melancholy that is inexplicable but wholly right. It's easy to declare that the undeniable visual artistry of Fantastic Mr. Fox reveals that the director has always been less a film-maker than a poser of action figures. Yet far from revealing the shallowness of Anderson's emotional understanding, the winsome pleasures of Mr. Fox throw fresh light on the essential humanity of the director's films, especially Rushmore and the underrated The Darjeeling Limited. In creating a fluffy fairy tale—a little starched and a little sad, as only he can do it—Anderson underscores his characters' egotistical need to control their environments, while simultaneously acknowledging how much fun it can be to fashion one's own little world.